32 Assembly Members Want to Reverse Cuomo’s Transit Raid. Where’s Shelly? 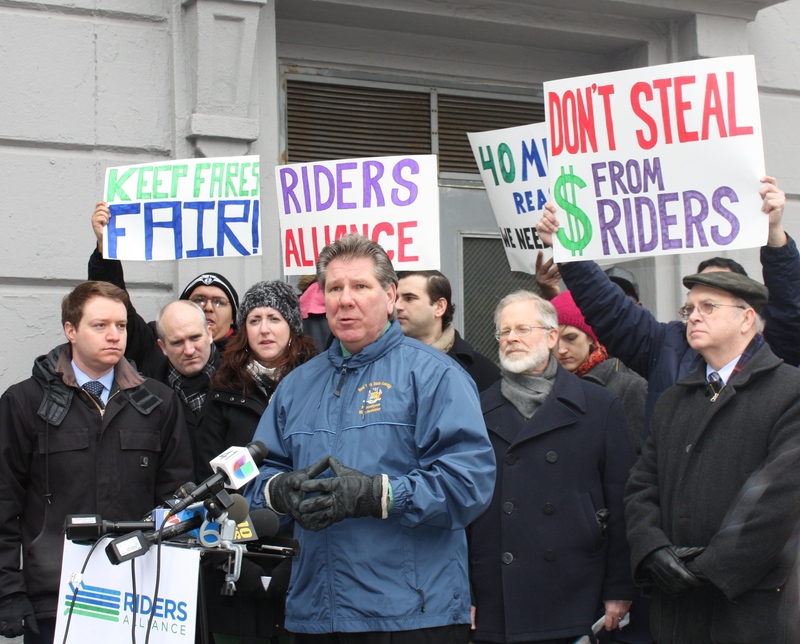 Assembly Member Michael DenDekker, with fellow members Nily Rozic, Richard Gottfried, and Jim Brennan behind him, speaks at Sunday’s rally against Governor Cuomo’s proposed transit raid. Not present: Shelly Silver. It’s crunch time for the state budget, and so far Assembly Speaker Sheldon Silver has not said a word about undoing the $40 million MTA raid in Governor Andrew Cuomo’s executive budget, even though 32 Assembly members have called on Cuomo to restore the funds [PDF]. Cuomo’s budget proposal shifts $40 million in bond obligations to the MTA, reneging on the state’s earlier promise to pay off the debt from its general fund. The cost-shifting sets a precedent that could cost the MTA nearly $350 million over the life of the bonds. That’s money the agency won’t have to expand service. Last year, when Cuomo snuck a $20 million raid into the state budget, the Republican-led State Senate actually removed the provision from its proposal, but the Silver-led Assembly did not, and it was ultimately enacted. Now the Assembly and the State Senate are putting the finishing touches on this year’s budget proposals, and Silver, who leads a caucus with dozens of members opposed to Cuomo’s transit raid, is the logical person to put a stop to it. So far, though, no word from Shelly. Silver’s Manhattan Assembly district neighbors — Deborah Glick and Richard Gottfried — have both signed on to the letter opposed to the transit raid. But the speaker’s office has not returned a request to comment. The Assembly and the Senate are expected to submit budget proposals in the middle of next week, with the actual dollars and cents getting hammered out as soon as today. If the Assembly speaker who represents transit-rich Lower Manhattan won’t stop Cuomo from raiding transit, who will? When pols are interested, it’s safe to assume the concern is more about protecting the unions’ cash flow than the riders’ basic need for mobility. And, more ominously, they’re afraid of Cuomo escalating. something tells me Shelly isn’t walking away from this empty handed. Will Cuomo Protect Transit Riders and Sign the Transit Lockbox Bill?